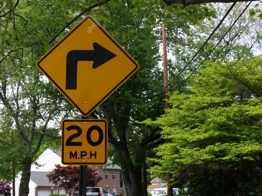 Turn, Curve & Intersection Signs By Street Sign USA! Turn & Curve signs, also known as Horizontal Alignment Warning Signs are used to advise motorists of a change in the roadway alignment. Intersection signs are used in advance of an intersection to indicate the presence of an intersection and the possibility of turning or entering traffic. Find a wide selection of road signs for municipalities & government entities, HOA's, builders, developers, businesses & property owners.